Opens with creamy vanilla and loads of fruit. Fruit basket full of ripe apricots, peaches, juicy oranges, quince, mirabelle and pineapple juice. Inebriant and very appealing. Hints of toffee with the typical Balvenie honey edge. Rich with subtle notes of cinnamon, ginger and oak in the back. The palate exactly delivers what the nose promises. Soft, almost silky, sweet and very fruity with a plethora of yellow fruits - apricots, mirabelles, juicy oranges, peaches and sultanas. This is lovely combined with creamy vanilla, toffee and honey. Gentle spice and oak layers towards the finish. The finish is medium long and creamy with vanilla, sweet barley sugar and fruity with sticky fruit jam. Slightly bitter notes of orange peel along with oak and cinnamon spice on the tail. A few drops of water bring more creamy vanilla and honey to the fore while the delicate fruitiness is only slightly tamed. More oak spice in the background. The sweet and creamy flavours are slightly reduced with an enhanced spiciness of oak, cinnamon, white pepper and ginger. The fruitiness is still present. The finish is rather short with vanilla and malted barley, subtle dry with more oak spice coming through. A luscious, rich and delicate single malt with a lovely mouthfeel. Shows an inebriant fruitiness - like walking through an orchard in summer time. Nicely complex and layered. Although having been matured for over 21 years in oak casks, the oaky and spicy flavours aren't dominating at all but stay in perfect harmony with the sweet and fruity layers of this beauty. Dangerously quaffable! 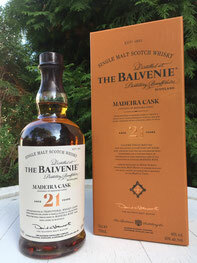 For this it isn't a bad thing that The Balvenie 21yo Madeira Cask is bottled at only 40% abv - you can have a second dram, or third.